Wow, as I write this the wind is howling and the snow is blowing. Temperatures are predicted to fall drastically for the next few days. Have you ever wondered if your Lecturer had lost her mind? Well, this may convince you. Tomorrow we leave for even colder Maine where they are experiencing the same blizzard conditions today and with promises that the thermostat won’t go above zero this weekend - my excuse for this – A late Christmas with our daughter, grandson and greatgrandchildren. I hope by now you have given some thought to our current Grange year. Does your Lecturer need help with programs? It’s possible your Lecturer is burned out. It happens. Why not offer to do a program for them. I’m sure it would be appreciated. 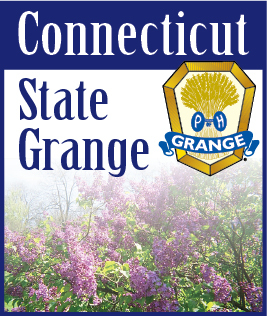 We have to work together to make our Grange an organization that new members would like to join. Please, when speaking to others, be positive. Point out all the good things we do. Do you like corn? Our essay contest remains the same this year. What is your favorite food? With the cold weather outside you might be thinking of a backyard barbeque. Why not tell us about those hamburgers, ribs, salads or even that watermelon for dessert. Complete rules are in the Bluebook and have been sent to all Lecturers. Below is last years’ 3rd place winner. Sweetcorn, especially that grown from the farm fields locally, is my favorite food. Dropped into a pot of boiling water right after being picked it is simply divine! Cut it off the cob and served in a bowl, just as scrumptious and not as messy. I always freeze a lot of sweet corn and we enjoy it until she has it again the following summer. Plantings are staggered so that we can get corn from the 4th of July until November! Corn chowder has become a true family favorite; that is, except for my husband. When I make corn chowder, I always make him clam chowder. I make steamers of corn chowder for our Grange Good Friday Chowder & Clam Cake Supper, our August Fair and Christmas Bazaar; corn: YUMMY!